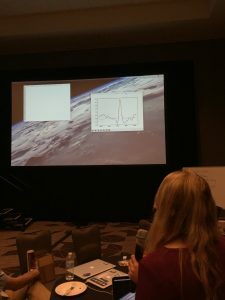 Our morning speaker Delores Knipp was an Air Force officer, meteorologist, and is currently a space weather scientist in the Aerospace Engineering Sciences Department of the University of Colorado. Space weather refers to the effects of the Sun (stellar physics) on the space environment (aerospace engineering) and on Earth’s upper atmosphere (meteorology) — and consequently on our society and technology (navigational instruments and spacecraft operations). Knipp’s broad background is not only extraordinary but is also necessary for the multidisciplinary nature of space weather. 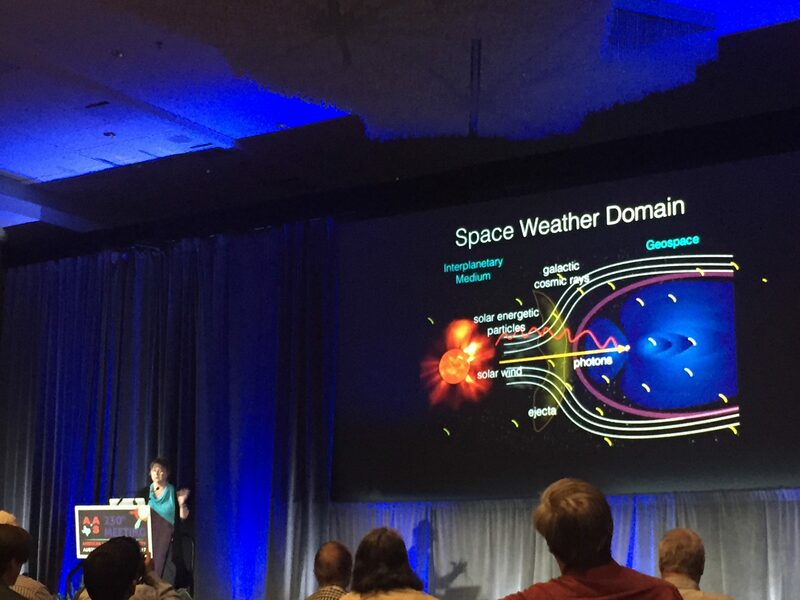 Knipp outlining the major contributors of space weather. The main causes for space weather are the energetic particles, radiation, and ejecta from stars and stellar explosions. Energy from space is vital to our well-being when it comes in mild and controlled doses, like the warm morning sunlight. However, out in space without the protective magnetic field of the Earth, a single energetic cosmic ray could destroy an instrument onboard an aircraft or damage the cells in a human body. This plenary talk was unlike any other talks I attended in academic meetings; it felt like a superhero movie. Hernán Quintana (Pontificia Universidad Catolica) is the winner of this year’s AAS Education Prize for his devotion and accomplishment in bringing upper education and astronomy into Chile. We are all used to seeing superheroes meandering through impossible circumstances and somehow saving millions. Quintana is not far from that. 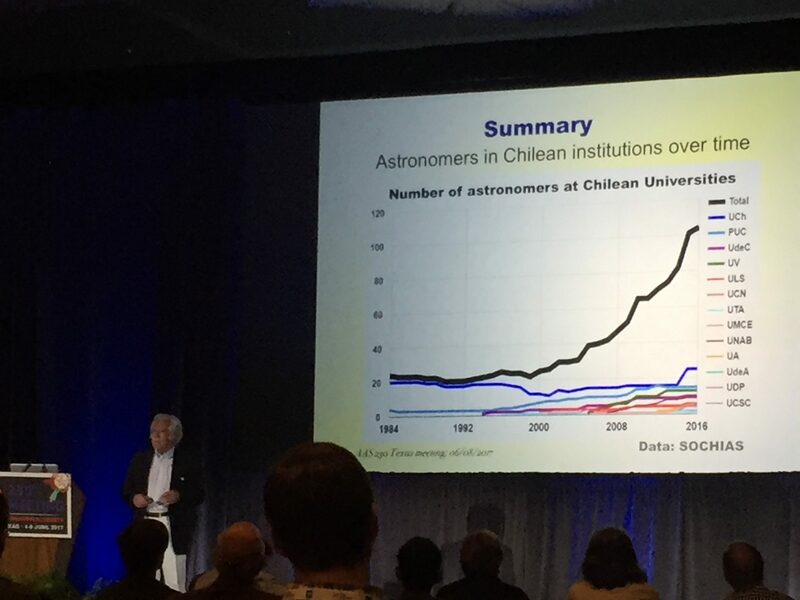 Quintana illustrating the growth of astronomy postdoc and faculty member population in Chile. Astronomers are no strangers to Chile; this country is the key attractor of the largest astronomical investments in the world. The Very Large Telescope (VLT), Atacama Large Millimeter/submillimeter Array (ALMA), and the next-generation Extremely Large Telescope (ELT) all call Chile home. The high-quality sky conditions make Chile a wonderland for astronomy. However, due to many historical and internal barriers, development of astronomy in Chile had been slow. Quintana built astronomy in Chile from almost nothing. An old policy in Chile required that admissions to astronomy BA and Master’s programs be limited by the number of future positions. As silly as it sounds, this policy took growth entirely out of the question. Budget reductions and economic crises in the 1980s further hindered plans for higher education in general. 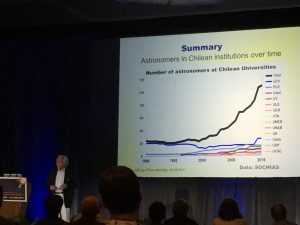 But by slowly building a growth mindset in the government and universities, gathering resources in every imaginable way, and initiating international collaborations, Chile has now become one of the fastest growing astronomy communities in the world. International collaborations with France, China, and Germany are all active projects researchers should keep an eye on. Thanks to Quintana there are even new endeavors in Chile beyond astronomy, including the development of detectors, mm-wavelength technology, and weather models for planning of observations. In the years to come, Chile is going to need ~300 astronomers to make good use of the new large telescopes! Whitley guiding us through the new tutorial for exploring K2 datasets. This AAS Hack Together Day was a fun one! 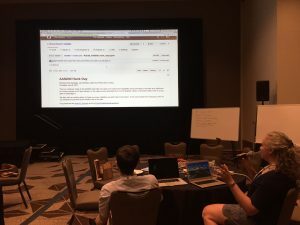 From 9:30 am to 3:00 pm, astronomers brainstormed and conquered their hack projects. Here’s a rundown on what they have accomplished. Given the amount of time they had, their work is truly impressive. Indahl demonstrating the automatic spectral fitting program. It fits spectra very quickly! Michael Gully-Santiago (NASA Exoplanet/Kepler) and Jena Whitley (UT Arlington) developed a learner-friendly pathfinder Python tutorial for future K2 (Kepler) and Astropy tutorials. Also thanks Gully for walking me through some cool Python packages for data visualizations — they will come in handy for my own research! The UT Austin team of Briana Indahl, Yao-Lun Yang, and Sam Factor put together an automatic spectral fitting routine for emission lines from galaxies. 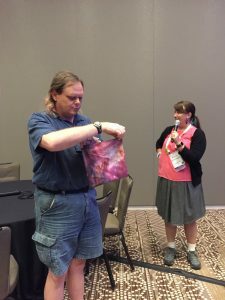 Rachael Livermore (UT Austin), Ashley Pagnotta (AMNH), and Jeffrey Silverman (SambaTV) coded and sewed a clothing-ready LED set that shined like observed supernovae! 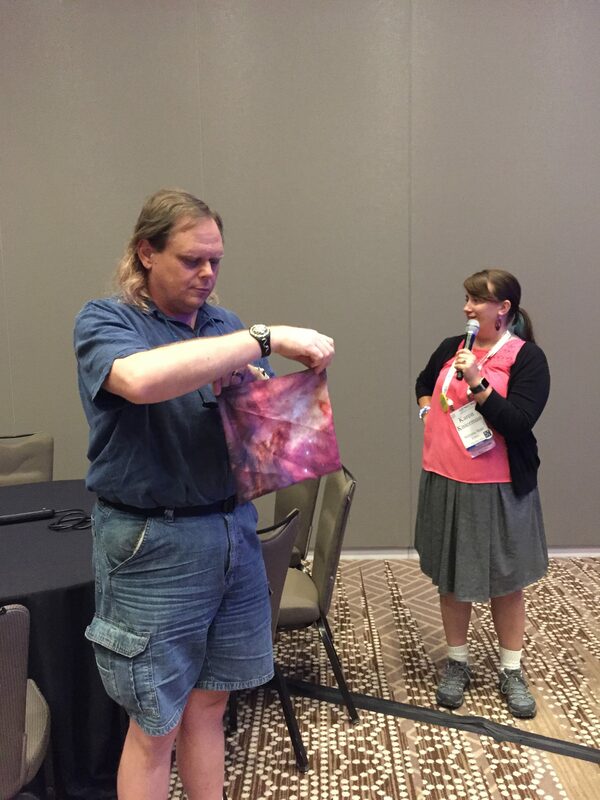 Young showing us the final product — a space pocket square with Hubble images on both sides. Lastly, the Arizona State University team Patrick Young and Karen Knierman’s created a supernova pocket square (Thanks Rachael for providing the gorgeous images and fabrics)! Kelle Cruz (CUNY Hunter College & AMNH) is to thank for organizing and coordinating the hack day event. It is in events like these that new ideas and collaborations take shape. See you at the next AAS meeting in Washington, DC. It’s my pleasure blogging with y’all!